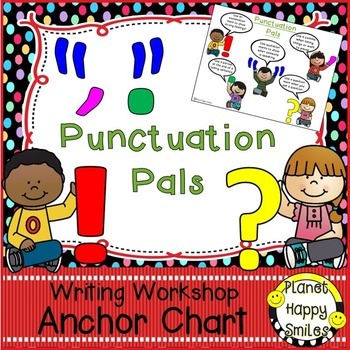 Writing Workshop Anchor Chart - "Punctuation Pals"
This is an anchor chart for using during your Writing Workshop mini-lesson. 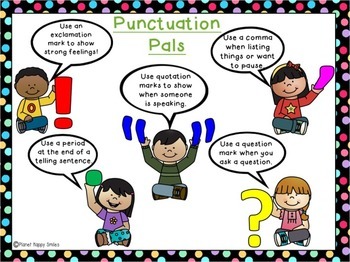 The topic is “Punctuation Pals". The idea is to make it with your students, but still be able to use it year after year without having to continually recreate it. Print out the pages. Cut out the title and graphics that go with the title. Glue them down to a short chart tablet and laminate. Laminate the other slides and cut them out. Attach velcro to the backs of the words and graphics and where you will be attaching them to the chart tablet. When you introduce each day the skill you want the kids to focus on, all you have to do is add it to the anchor chart. It is great if you have a switch class. You can just take off the skill that you taught that morning and re attach it for your afternoon class. 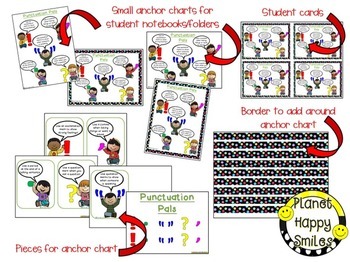 This saves you a lot of time each year of creating the same anchor chart. 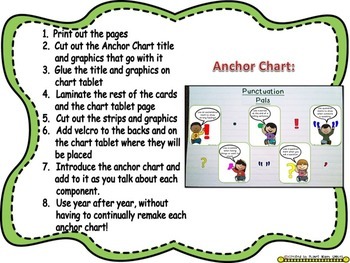 You can also use the small version of the anchor chart to show on the smart board or on a screen. This could stay up during their independent writing time for you to refer to as you are conferring. We hope you find this helpful and you can utilize it with the kids! Happy Writing! Writing Workshop Anchor Chart - "What can I write about?" Writing Workshop Anchor Chart - "What gets a capital letter?" Writing Workshop Anchor Chart - "What do good Writers do?" Writing Workshop Anchor Chart - "Writing Leads to catch the Reader's eye"
Writing Workshop Anchor Chart - "Can you Read my Writing?" Writing Workshop Anchor Chart - "I use my Writer's Eye!" Writing Workshop Anchor Chart - "Small Moment Writing"
Writing Workshop Anchor Chart - "Writing Pattern - Organizing my Story"
Writing Workshop Anchor Chart and bonus items ~ Call the Cops! Writing Workshop Anchor Chart - "Writers can Write..."
Writing Workshop Anchor Chart - "Good Writers use Time Order Words"
We hope you like this product. Please rate it on the TeachersPayTeachers page. Remember when you rate a product, you get TPT points to use toward other products that you purchase. If you have a problem with this product, please contact us & we will try to correct it before you give us a rating. We work really hard to make our customers happy! Please follow us for more fun items and freebies!